Putting the Woolsey Fire into proper perspective, especially as there are also other fires devastating people’s lives, is something I’m not equipped for. There has been enough tragedy this past month that there hasn’t been the opportunity to feel grounded as a human being. Maybe it’s because I’ve been in a constant state of shock, but I’ve felt more distant than expected in connecting emotionally as this disaster spread even though I intimately know the area and many friends affected. Over the weekend, I started going though my past photos of the Santa Monica Mountains that overwhelmed me with the amount of great memories which fire or not will always stay with me. Sifting through them gave me a bit of perspective, but once I started to place them on a map it really connected me to the scale of it all even though I only added a small portion of my pics. 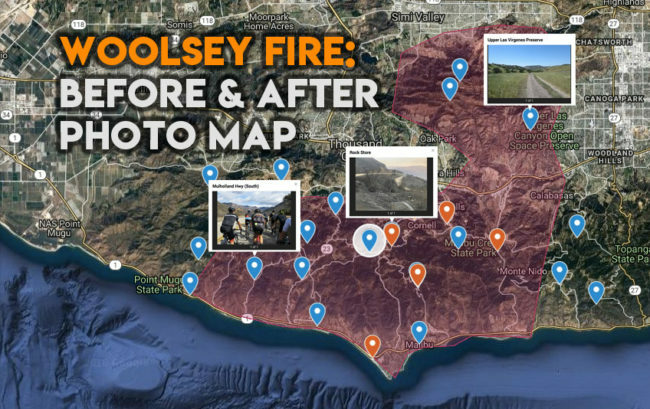 I also added links to photos from the fires to show the juxtaposition (the fire map is a rough estimate). If you have any that you’d like to submit, please email them along with map pinpoint to ciclavalley@gmail.com and I’ll do my best to add them.